Designed for the extreme situation, the 4Star jockey skull is certified to the top international standards. A technically superior helmet, the deep-fitting 4Star is the result of years of advanced computer analysis and incorporates the latest aramid fibres, which are embedded in a tough resin matrix for vastly improved crush resistance. The neat quick release buckle in a high strength alloy fastens the patented GRpx® harness system for the ultimate in stability. The 4Star helmet also features the new Charles Owen “Free Fit” system which allows for increased airflow across the forehead. It combines a frontal air channel with a Coolmax® mesh which significantly increases cooling and evaporation of sweat. Add this to the 10 ventilation slots and the 4Star is the coolest ride yet. 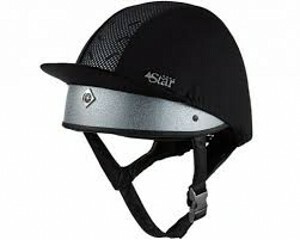 Perfectly finished with a black ventilated silk, the 4Star helmet is the ultimate choice for the safety conscious rider.